Greetings from Minnesota…wish you were here! Photo taken today at my friend’s spectacular perennial garden. It was yet another amazingly warm summery day here in Minnesota. The thick, heavy air finally gave way to vast thunderstorms which swept away all the grime and made everything brilliant. I took this photo today at my friends gorgeous backyard garden. It inspired me to try planting some Bleeding Hearts for next Spring. They are so delicate and so beautiful. ← Signs of Summer: The mushroom or the bee? 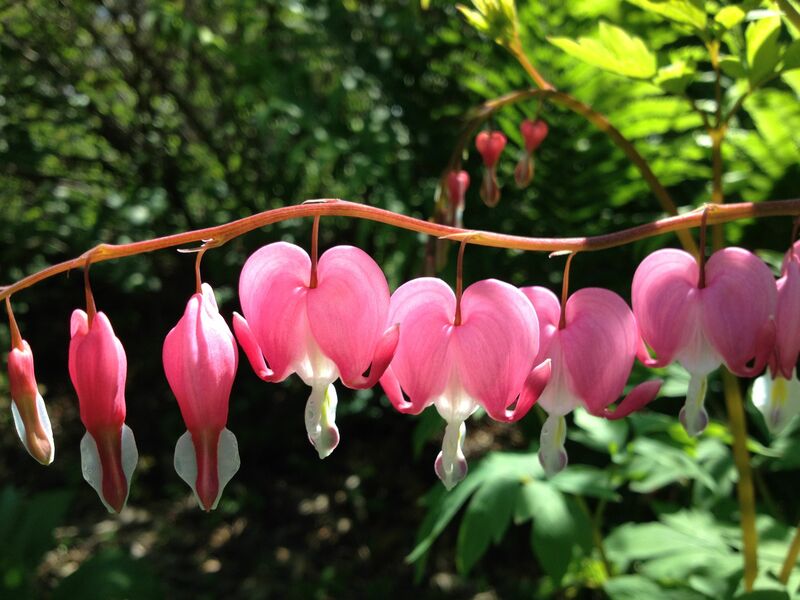 Ah yes these are called “Bleeding Hearts”. They are just about to bloom near where i live. Great photo. Wow, I am surprised you guys are so much further behind in spring! But then again, you are lucky that you will get to see them soon as ours are starting to fade. I like the white ones too! I just planted some in my garden this year so next spring I’ll get them for myself!